Got my light assembly in from Dan today. Works like a champ, just like the factory light but much brighter. Nice. I'm glad that you were able to fix it like I did. Hello, new to this and just bought a new 2016 Explorer XLT. Had a question about replacing the map dome light to LED cannot find how to take off the cover. Dont want to mess it up already so wanted to find out before trying anything. Anyone knows how to take off the cover and replace the bulbs on the dome lights and cargo lights in the back? and since im asking already just to be sure the map lights in the front too? Your thread has been merged with this one on swapping to LED. Although the answer to the cover removal is not shown, I suggest that you send a message to Capt343 who posted the following thread on the 2016. I'm guessing that he has done the cover removal. I don't recall any other posts about the cover. I also have a 2016 explorer. I am also interested if anyone has converted the 2nd and 3rd row overhead lights to led. Anyone convert their 2016 2nd and 3rd row overhead lights to led? Do you know if they are different compared to previous models? I'm guessing that the procedure would be much the same. My 2016 Ford Explorer has the 2nd and 3rd row overhead lights on the center region of the headliner "over your head" not towards the side above the windows. Is drive brite the only company modifying the stock 3rd row light assembly? Swapped out all my others with LEDs and would like to complete the interior swap. What's everyone running for led puddle lights? I did a set for my f1 a while that didn't turn out bad, but would rather buy a decent set. I would highly recommend purchasing the puddle lights from there rather than trying to hack up your assembly. check this out if you don't want to hack apart your assembly. Will their LED kit do the entire vehicle on the inside? I have a 2017 Sport. Is there modification to just change the bulbs? Thanks. Possible solution for the 3rd row. I own a 2015 focus st and the interior lights look just like the 3rd row explorer one. These use standard bulbs. It may be possible to swap it out. I plan to give this a try in the near future. I'll update once I have results. Yes. The LED from DriveBright includes map, 2nd row and 3rd row cargo (by power fold buttons). I got the Kit, 3rd row dome, puddle and license plate lights from DriveBright. Pretty happy with them. Only exception was the license plate bulbs were a little yellow so I had to go and get another pair. Hi, i was replacing all my interior lights with leds. 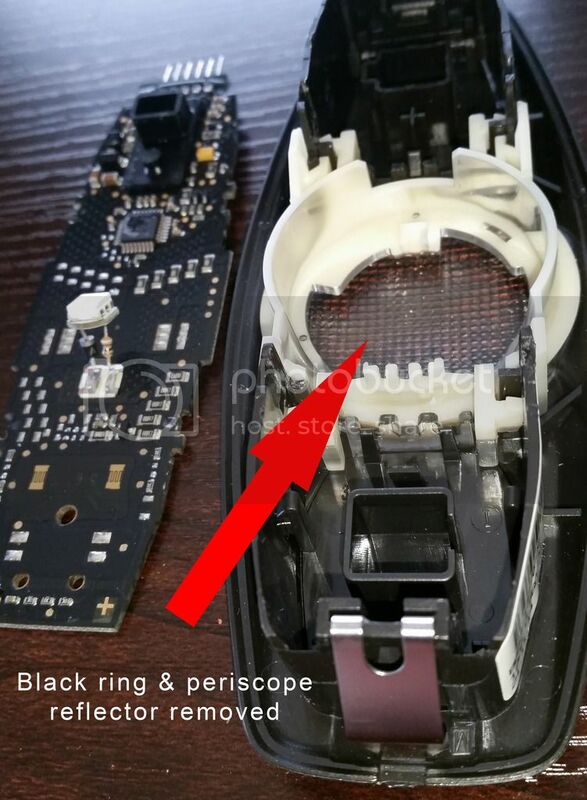 The rear dome light has a weird looking circle button light attached to a circuit board. 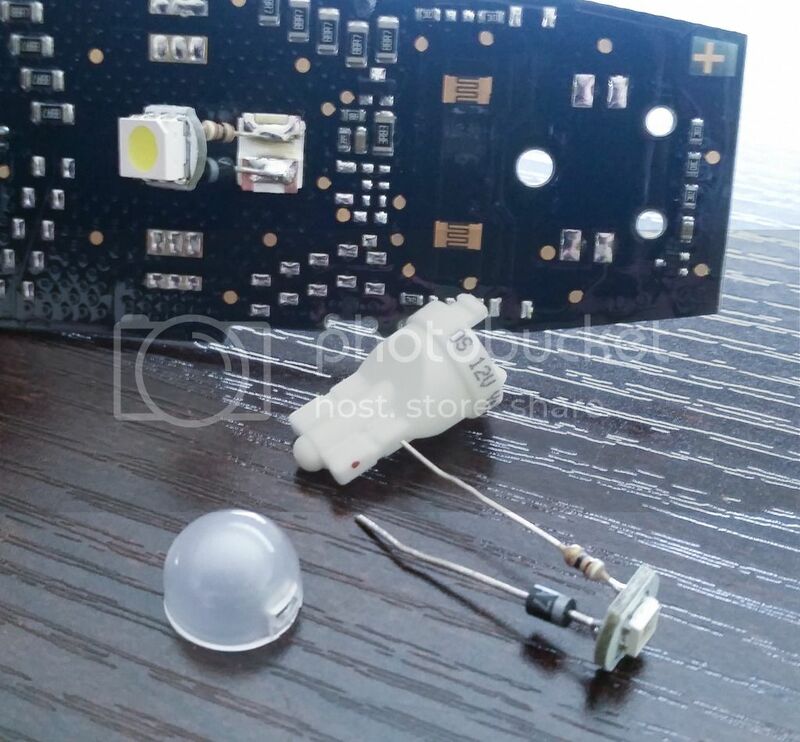 Is there any way to replace that to an led? As everyone knows, these are tricky buggers, but I didn't find the solution all that difficult. And a hat tip to chieftomahawk for showing the rest of us the way! 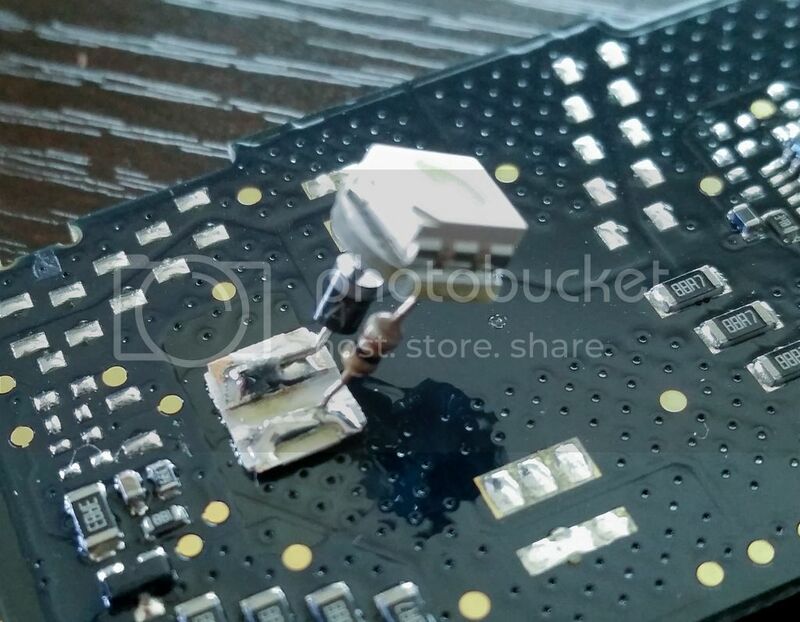 Popping out the circuit board is easy, but do it gently not to break anything. I covered the circuit board in several layers of blue painter's tape to protect the other surface mount devices from damage. I used a flat file and carefully filed the LED down through the packaging, through the LED chip, and finally reached the two copper contact pads. It took about 30 minutes to do the filing, but I didn't want risk damaging anything else. A bit tedious, but I just worked on it while I watched Netflix. Once I reached the copper contact pads, I cleaned everything up and removed the painters tape. I disassembled one of the 194 LED bulbs. 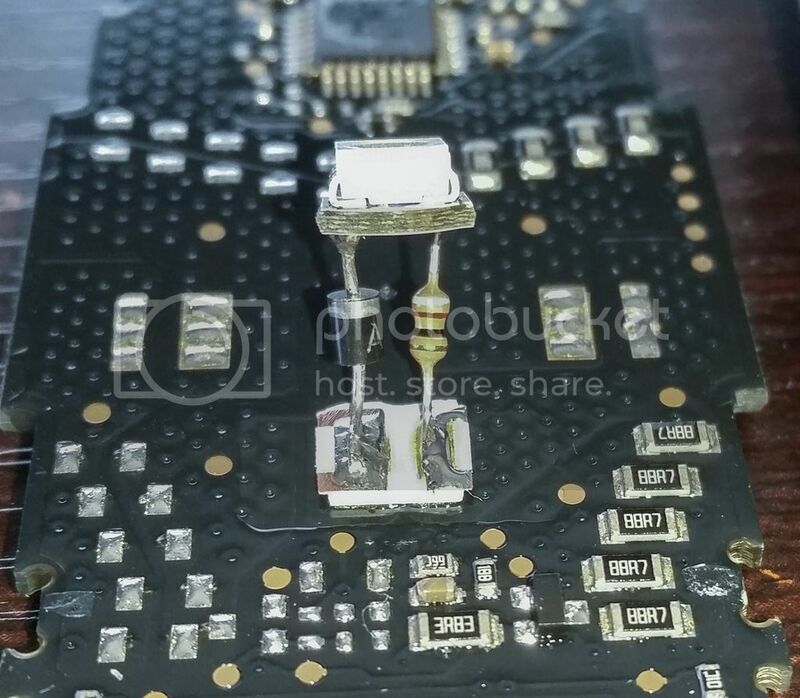 I plugged the circuit board back in to the car's wiring harness, and held the LED against the copper contacts to determine which way the LED needed to be soldered in to work (again - polarity matters). Once I had determined the polarity, I unplugged the circuit board, trimmed the leads, and soldered the LED to copper pads. I plugged the board back in to make sure it work before I finished reassembly. Then I removed the periscope reflector and the black ring from the lens housing. Since I had changed the LED, the reflector was pretty ineffective, and the black ring only reduced the spread of the light, so I figured I was better off without them. Popped the circuit board back in to the housing and reinstalled. Even without the 1k resistors, I haven't experienced any of the eratic behavior that others have reported, such as the light not going off when the rest of the lights do. All interior lights seem to work perfectly.